League One defenders across the country will be getting that sinking feeling again after Kieffer Moore hit the goal trail. Moore plundered a brilliant hat-trick as Barnsley’s dream start to the season continued with a 4-0 win at Rochdale. Moore was prolific in this division for Rotherham last season, scoring 13 goals in 22 appearances – form which earned him a move to the Reds. And he opened his account for the season in style, with Brad Potts opening the scoring as the Reds won a third game from four. Moore set the tone when he headed against the crossbar in the third minute, with Alex Mowatt hitting the post soon after. Failing to act on the warnings that the Reds were in no mood for another goalless draw, Daniel Stendel’s side broke the deadlock in the 35th minute through Potts, who headed home Moore's cross. Barnsley were at it again seven minutes later. With another ball in collected by Mamadou Thiam, his lay-off to Dani Pinillos proved vital with the Spaniard whipping in a left-footed ball which found the head of a waiting Moore who doubled the Reds’ lead. After Adam Davies thwarted Ian Henderson shortly after the restart, Thiam broke down the left wing and found Moore, who beat Lillis with a well-taken finish into the right corner after 48 minutes for his second of the match. His hat-trick came in the 68th minute. Like his second, it was all his own work and he beat Magnus Norman, who replaced injured Rochdale goalkeeper Lillis minutes before, again at his far post. Stendel asked his players for a response after the 0-0 draw against AFC Wimbledon and told them to find a way of how to break down teams who set up to suffocate their attacking threat. He got what he asked for and much Moore. Rochdale: Lillis (Norman 61), McGahey, McNulty (Rafferty 45), M Williams, Delaney, Ntlhe, Cannon (J Williams 80), Perkins, Done, Andrew, Henderson. Unused subs: Camps, Rathbone, Wilbraham, Inman. 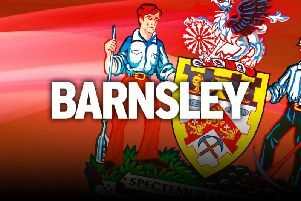 Barnsley: Davies, Cavare (J Williams 79), Pinnock, Lindsay, Pinillos, Potts, Dougall (McGeehan 66), Mowatt, Thiam (Moncur 66), Moore, Bradshaw. Unused subs: Walton, Jackson, Adeboyejo, B Williams. Attendance: 4,359 (1,703 from Barnsley).